Links to the Twitter lists for the New Media Age Top 100 Interactive Agencies and the “Ones to Watch” for 2010. A Flash Interactive Twitter client for viewing the tweets and twitter statistics of the NMA “Ones to Watch” Interactive Agencies of 2010. 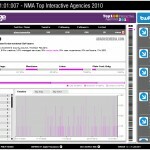 A Flash Interactive Twitter client for viewing the tweets and twitter statistics of the NMA Top 100 Interactive Agencies of 2010. Finished the detail page and added some additional functionality. 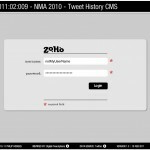 A Flash Interactive Twitter client for viewing the tweets and twitter statistics of the NMA Top 100 Interactive Agencies of 2010. Detail page added for each agency showing statistics summery and charts for tweet time-lines as well as hash tag and mentions. 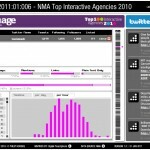 A Flash Interactive Twitter client for viewing the tweets and twitter statistics of the NMA Top 100 Interactive Agencies of 2010.